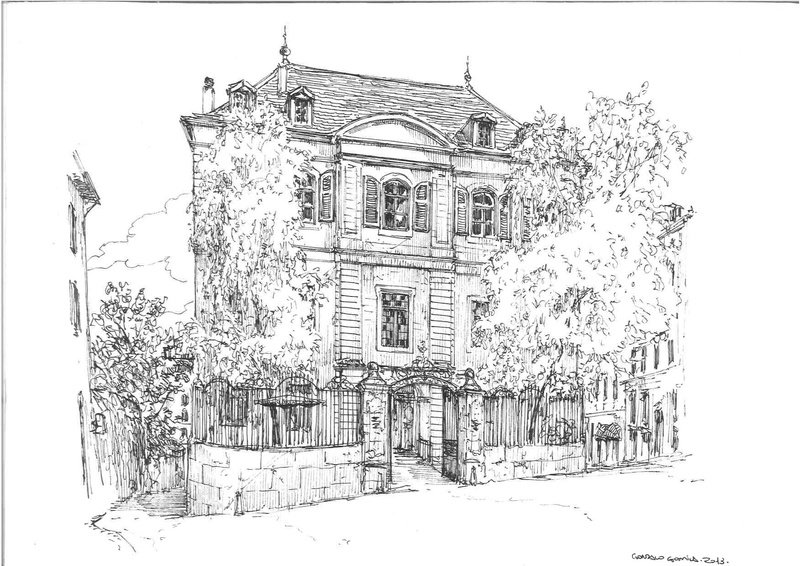 A brief history of the English Speaking Congregation of the Evangelical Lutheran Church of Geneva. Arne Sovik/Stephen Larson (Arne Sovik died in September 2014 at age 96). In the years following the Second World War, reconstruction and reconciliation were priorities of churches as well as political and economical organizations. The task was not only to rebuild cities and social structures devastated by warfare but also to rebuild the relationship among people which had been strained and broken. In those years, increasing numbers of English-speaking people arrived in Geneva to work with the United Nations, business organizations, diplomatic missions and international organizations, including the new Lutheran World Federation and World Council of Churches. These English-speaking people were not only from North America. They came from throughout the world, from every continent on earth. In the early 1950′ English language Lutheran worship services began to be held in Geneva. These early gatherings were marked by dedicated volunteer leaders who assembled the people, preached the Word of God and celebrated the sacraments. By 1952, a small group of Lutherans of other than German background began to meet for worship each Sunday evening. A Scandinavian Lutheran community also began to meet monthly. Most of these groups were ecumenical organization staff members. Pastors Igor Bella, Pierre Fraenkel, Carl Lund-Quist, Paul Hoffman and Dr. Whiting aided in getting the services organized. In Romans 11, St-Paul wrote of the church being grafted onto the cultivated olive tree of God’s faithful people. In similar fashion, one might speak of the English-Speaking Congregation being grafted onto the historic presence of the German Lutheran Church of Geneva. For in 1954, the German Lutheran Church amended its constitution, changed its name to the Evangelical Lutheran Church and made it possible for non-German speaking Lutherans to affiliate with the church. These were the beginnings of an “international” Lutheran church in Geneva. In subsequent years, the church was to become increasingly ecumenical as well as international. By 1955, “The English-Speaking and Scandinavian Chapter” of the church received a preliminary structure and representation on the Church Council. The German pastor was recognized formally as pastor of all, but practically, the services in English and Swedish were led by clergy within those groups. In 1958, and American pastor with close Swedish connections, Rev. David Holm, was called to minister in both languages. Financial assistance in these early years came from the Lutheran World Federation. By 1959, due to lack of space in the Chapelle des Pélerins (Rue St-Léger), worship services were moved to the Bourg-de-Four church. The German group accommodated by moving its time of worship to 9:30. English services were held at 11:00 and Swedish at 5 p.m. A youth’s group and women’s group were organized. Pastor Holm resigned to go to Sweden. In 1960, a bi-lingual pastor, Rev. Lowell Albee, began work, serving until mid-1961. A monthly newsletter appeared, forerunner of The Geneva Lutheran. In 1961, a Swedish pastor, Rev. Lennart Söderström, began to serve the Swedish group, which led to the practical division of the two language based groups while still being related through the Church Council. With the dissolution of an ecumenical, English language Sunday School, a Sunday School was established within the Lutheran Church. After a two-year vacancy, Rev. Dr. William Van Horne Davies came as pastor in 1963. Tragically, he died less than a year later. In 1965, Pastor Clarence Nelson began his three year ministry, during which the congregation began a growing outreach to members of African and Asian nationalities. In 1966, the principle was adopted of designating 20% of all income for mission and service work outside the congregation. That same year the constitution was amended to recognize three distinct congregations under one Evangelical Lutheran Church of Geneva Church Council. In 1967, the English-Speaking Congregation (ESC) numbered 170 baptized members. 1968 marked the year that the ESC became nearly financially self-sufficient. Weekly worship attendance was well above 50% of the membership. That August day that we stepped on board ship to cross an ocean for the first time continues to be the step that shaped and stretched our lives in ways that cause us still to marvel and wonder! Our Geneva experience rewrote and redefined many things for us in indelible ways. In fact, in ways that continue to keep redefining ministry as privilege, keep us living daily life with expectation, and keep us open to the surprises the Holy God still may spring! The Geneva experience revealed in convincing ways a Church with a very human face and heart, and in compelling ways, a Church with the face and heart of God. Our Geneva experience created for us an extended family that even after all these years has world-embracing postmarks! Here were several issues tackled by the congregation in the years 1968-1975: What does it mean to be Lutheran and ecumenical and international, and how does a congregation live out those challenges as opportunities in a setting like Geneva? What does it mean to be a partnership of language-speaking congregations, and how do people of those congregations worship, witness, learn and serve together? What is the role of a called and ordained pastor in a congregation of many ordained members? And how are the gifts and experiences of those ordained members affirmed and incorporated into the congregation’s life and ministry? What is the calling of the congregation in dealing creatively and responsibly with the “procession of people” that is Geneva; in making Geneva “home for the present,” and in keeping people ready for return “back home” after Geneva? There were also many highlights and significant events during these years: How eagerly we watched the construction of the new organ across many months, making us more than ready for that Advent dedication! How quickly we responded to the call to play a part in hosting the LWF Assembly in Evian, when suddenly Lutheran itineraries shifted from Brazil to France! For us as family, how grateful we were to be able to celebrate the birth and baptism of a son within the Geneva family! From our vantage point of ministry in 1991 in Denver, USA, we realize that the whole Geneva experience was a “significant event.” There were lessons of learning together with always new partners; lessons of hospitality to and from and with newly arrived residents, guests and visitors; lessons of commitment in spite of all kinds of things that would demand otherwise to a hopefilled vision of the Church, world and future. That behind and beyond the headlines are the heartaches and hopes of real people attempting to be faithful to the hope-filled vision of Christ! We can’t build a Sunday school curriculum that lasts 36 weeks. We have to be more flexible than that. So in September we had a four-week session with all classes studying “A Man Called Lord”. October is interrupted with a “Potato Holiday” for students, so we concentrate on retreats. In November, we’re planning Sunday morning breakfast and Bible study in the homes of members. In December, we’re designing “peace on earth” packets for home use. Vacation Church School is held during Holy Week to take advantage of school holidays. Pastor Swenson returned to the USA serving as senior pastor of Augustana Lutheran Church in Denver, Colorado. Growth within the congregation continued during these years, reaching 314 baptized members in 1974. By 1969, the congregation was virtually self-sufficient financially. For the Easter Sunday service, 1976, I wired a message to be read to the congregation. It said:”Thinking of you in a special way today. Easter greetings in the risen Christ. Letter with follow.” I signed it, “Your Pastor.” That began six years of what proved to be highlight years of ministry for us. As we began, membership rolls listed 96 units. In spite of the fact that after 1980, some American corporations began replacing Americans with European in their Geneva offices, the membership rose to 115 units when we left in 1982. One of the reasons for this was an increase in the internationalization of the membership. For example, I specifically recall 17 African families counting themselves as members. Each Christmas season an Indonesian service was conducted in our church followed by a reception in the Indonesian ambassador’s home. Korean worship services were begun as well as Bible classes in Japanese. Already in 1976, we were discussing plans for a remodeled church. At that time, the “proposals” were more modest than what became a reality in 1991. In spite of what at times seemed like insurmountable obstacles, discussions continued. Perhaps some of the early discussions laid the ground work for bringing to its ultimate fruition. One of the more enjoyable highlights were the annual seminars we were able to conduct on world problems, such as world hunger, and root causes of social and economic injustice. Only a congregation such as ours could bring together people with international responsibilities representing the church, the government and the business communities. We began the seminars with three-fold agreement: (1) that we were all Christians; (2) that we had sometimes radically different perspectives and that we would not only give our own input, but also would listen genuinely to what the other was saying; and (3) that we would conclude sessions each changed a bit in our thinking. We never lost sight of these approaches and the result of the seminars permeated the entire congregation, sometimes with tangible programs. Another highlight event was the sponsorship of the annual conference of pastors and spouses for the Association of International Churches of Europe and the Middle East, highlighted with the Sunday worship experience, followed by the international salad buffet at the Ecumenical Center. It was during our tenure that the Harvest Festival was introduced to the congregation, beginning as I recall with the African tradition and subsequently incorporating also some Italian customs. Another meaningful experience was the annual outdoor Ascension Day service in the mountains, followed by a congregational picnic. I still remain in touch with the family whose baby I baptized at one of those Ascension Day services. After one leaves Geneva, one appreciates even more how much the congregation epitomizes the definition of the church in the Nicene Creed. It is truly “one,” transcending all denominations and cultures; it is “holy,” made up of real saints of God who know what it means to love; it is “catholic,” truly universal, bringing together “people from the east and from the west,” – and from the north and the south “to sit down together in Abraham’s kingdom”; and it is “apostolic,” “built upon foundation of the apostles and prophets, Jesus Christ being the chief cornerstone”. What a prestige to have served. It was during the tenure of Pastor Fields that the congregation called a deacon to serve the congregation. Tom Dorris, who worked as the editor of the Ecumenical Press Service within the World Council of Churches, was ordained to a diaconal ministry and has served the congregation as a deacon since 1980. On March 27, 1980, a new constitution was accepted. With the adoption of a new Church Constitution the equality of the German and English-Speaking Congregations under one Church Council was emphasized. Although my pastoral tenure was brief, memories of significant opportunities to provide pastoral care, enhance relationships with the German-Speaking Congregation, and strengthen ecumenical relationships in the international community remain strong. No sooner had I arrived in Geneva than I participated in the celebration of the 275th Anniversary of the congregation on June 5, 1983. A close professional and fraternal relationship with Volkmar Klopfer proved helpful in fostering a strengthened climate of cooperation between the two congregations. At long last, after years of discussion, an extensive renovation project was approved and a joint worship service and meeting held in the Ecumenical Center chapel in January 1986, focused on the proposed renovation plan as designed by Jachem Poensgen. A Renovation Committee was appointed to establish a well-coordinated plan which attempted to enlist every member and friend of the community in some aspect of the renovation project. In June 1986, a Kick-Off Fête triggered on-going fund-raising activities between the two congregations. Numerous ecumenical opportunities arose to extend ministry to the international community. Significantly, the ESC through its lay leadership and my support and encouragement helped to introduce to Geneva the Cursillo movement. This program which is designed to equip one in daily Christian living provided me with broad access to identify with and extend pastoral care in the wider community. In addition to fostering the traditional Potato Week Vacation Bible School and the joint Thanksgiving and Ascension Day worship services with other denominations, of special note was the celebration of the 450th Anniversary of the Reformation in Geneva (May 1986) and the undergirding of closer relationships between Reformed and Lutheran Christians. Rich images of grace-filled members committed to upbuild Christ’s church include: confirmation classes around the kitchen table in the pastor’s apartment; Bible study and fellowship with the women of the Work Group, who handcrafted treasures to be sold at the bazaar in support of a needy charity; a “white tornado” snow storm which immobilized the Bourg-de-Four and brought out the stalwart Asian members for Sunday worship; Deacon Tom Dorris’ sensitive leadership in assuring that the Easter Vigil experience became a part of the worship tradition of the joint congregations; the auctioning of harvest gifts from different cultures in thankful response to the blessing God gave us in our life together in Geneva. The tension of living in a diverse international and ecumenical community was also lived out in the life of the congregation when the decision was made that the eucharist and the “gathering of the nations” around the Lord’s Table should be celebrated weekly, rather than once a month and on special feast days. I remain grateful, knowing that the fellowship, by congregational vote, affirmed the goal of weekly eucharist and in the unfolding years agreed to work creatively to find ways to move this goal. In the interim between the departure of Pastor Bartling and the arrival of Pastor Larson, the English-Speaking Congregation was blessed with the services of Pastor Peter Raquet, an American Lutheran Church pastor living in Geneva. His volunteered service of ministry to the congregation was deeply appreciated. Between Pastor Raquet and the Congregational Committee president, Esther Rajashekar, the congregation was well served during the interim. In 1986, the Renovation Project was formally launched with a total budget approximating 1.8 million SFr. Special fund raising events began to be held, including the Renovation Concerts. In May 1988, Rev. Dr. Stephen Larson, from Canada, was called as pastor. (He continued to serve as pastor of the English-Speaking Congregation for five three-year terms until 2003. He would return again as interim pastor from 2012 – 2014). In the fall 1988, the Fête du Bourg-de-Four provided a festive atmosphere for the Old Town. Many Geneva organizations cooperated with our church in raising over 50,000 SFr. for the renovation. By the end of 1990, thanks to a gift of 400,000 SFr. from the Loterie romande, the target goal was nearly met. Due to the construction work in the church, the English congregation moved their worship to the Eglise St. Germain, for nearly all of 1990. That temporary dislocation proved to be a marvelous incentive to, and opportunity for ecumenical cooperation with the French-speaking Old Catholic congregation. An ecumenical, bi-lingual Easter Vigil was celebrated with them the night before Easter. March 2 and 3, 1991, marked the official opening ceremonies, Open House and worship services of re–dedication in the renovated church. Rev. Dr. Carl Mau, former General Secretary of the Lutheran World Federation and active member of the English-speaking congregation, preached the sermon at the English service. While we edit a formalized update of the English-speaking congregation history (describing events during the tenures of Rev. Lusmarina Campos Garcia, interim pastor Rev. Dr. Stephen Larson, and current pastor Rev. Andy Willis) — here is an updated record of pastors since the beginning of the ESC. – from the ESC website.